After the revelations in the press about certain Pakistan players, I thought that the atmosphere at The Oval for the ODI would be highly charged and I was not wrong! 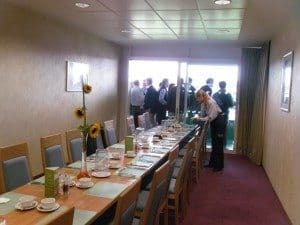 My guests arrived in their private box within the new OCS Stand to enjoy some delightful hospitality at The Oval early on in order to soak up the atmosphere and of course, commence the day’s fluid intake! 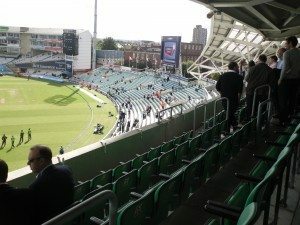 As this was my first visit to the new stand at The Oval, I was extremely impressed by the quality of the boxes. They are nicely furnished with plush carpet, nice dining tables and of course, your match seats directly outside which is perfect for thirsty viewers! There are plenty of extremely polite staff always on hand and security is tight allowing for a relaxed approach within the boxes. Breakfast was a small offering but nicely presented and well cooked (I did try one in the interest of research of course) of sausage, bacon, fried bread, mushrooms, vine tomatoes and scrambled egg. There are muffins served all morning however if I am totally honest, I do think that another snack should be served between breakfast at 11:30 and lunch/dinner at 16:30. They are looking into this for next year as there were a lot of comments on this to the Oval that day. This did not detract from my client’s enjoyment of the day and as the cricket got underway and Pakistan looked to be the winning team there were many bets going on as to the outcome. I wouldn’t hesitate in placing clients in the OCS Stand at The Oval next year and I look forward to seeing you there in 2011.